In October, 2018, Northleaf Capital Partners closed the debt financing of a 493.65 MWp solar plant in Murcia, Spain. Global Capital Finance acted as exclusive financial advisor to Northleaf. In October, 2018, Enlight Renewable Energy Ltd. acquired 3 SPV’s, each holding one solar project at NTP stage in Hungary for a total of 57.4 MWp from BNRG Greenevolution and Öko Consulting. Global Capital Finance acted as exclusive financial advisor to Enlight. In August, 2018, Northleaf Capital Partners acquired a special purpose Spanish corporation holding the permits for a 493.65 MWp fixed tilt solar PV plant in Murcia, Spain, to be constructed under Spain‘s regulatory support scheme in line with the July 2017 Spanish auction award. Global Capital Finance acted as exclusive financial advisor to Northleaf. In April, 2018, Keybridge Capital sold a 1.045 MWp solar photovoltaic plant in the Totana region of Spain. Global Capital Finance acted as exclusive financial advisor to Keybridge Capital. In December, 2017, affiliates of Agilitas Capital entered into partnership flip transactions for 8.393 MW solar PV facilities on Long Island, New York. Global Capital Finance acted as exclusive financial advisor to Agilitas. In December, 2017, Triodos Renewable Europe Fund (TREF) acquired juwi Gründungskommanditist Germany GmbH’s member interest in Windpark Amoeneburg-Roßdorf II GmbH & Co. KG, the SPV holding a 5.56 MW wind farm in Germany. Global Capital Finance acted as exclusive financial advisor to TREF. In March, 2017, Kommunalkredit Austria AG provided a mezzanine loan to the Irish solar developer BNRG Renewables Ltd. against 4 operating solar PV plants in the UK, (one FIT plant and 3 ROC 1.3 plants, totaling 19.5 MWp). Global Capital Finance acted as arranger and financial advisor to Kommunalkredit. In January, 2017, Vortex Solar UK Limited acquired TerraForm Power’s 365 MW UK Solar Portfolio comprising 24 operational solar PV plants under the UK Renewables Obligation scheme. Global Capital Finance acted as financial advisor to Vortex. In December 2016, John Laing Environmental Assets Group (JLEN), the environmental infrastructure investment fund of John Laing Group plc, a British development, investment and management company of infrastructure projects, acquired the 4.0 MW wind farm Energie Eolienne de Plouguernevel in France. Global Capital Finance acted as exclusive financial advisor to JLEN. In September, 2016, Global Capital Finance provided valuation services regarding the 400 MW wind farm projects of NGC Partners in Romania. In August 2016, üestra, the transportation authority of the City of Hannover, Germany, early terminated a US lease transaction for rolling stock entered into in 1998. Global Capital Finance acted as exclusive financial advisor to üestra. In July 2016, John Laing Environmental Assets Group (JLEN), the environmental infrastructure investment fund of John Laing Group plc, a British development, investment and management company of infrastructure projects, acquired the 5.6 MW wind farm St. Goueno in France. Global Capital Finance acted as exclusive financial advisor to JLEN. 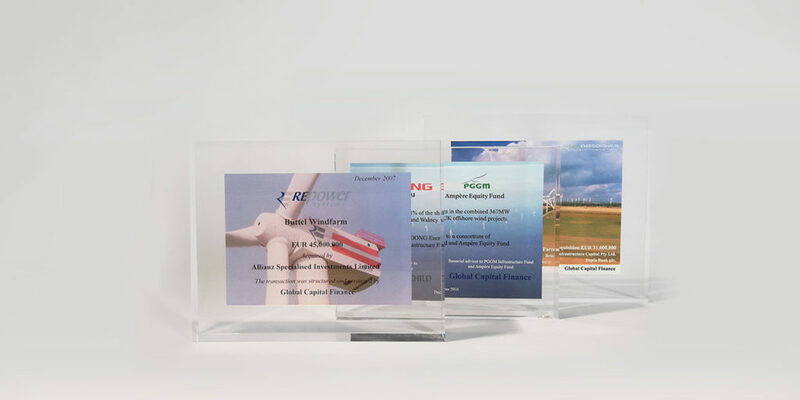 From August 2015 until July 2016, Global Capital Finance provided strategic advice regarding renewable energy and sustainability to AGL Energy Limited, a publicly-listed Australian provider of energy products and services and Australia’s leading renewable energy company. In April 2016, NRG Services sold DBM, a 19.8 MW biomass power plant in Szakoly,Hungary, to a major international utility. Global Capital Finance advised the seller. In March 2016, Dravus Investment, a Slovakia based solar PV developer, closed the debt financing of a 5 MW solar plant in Salonta, Romania. Global Capital Finance acted as arranger and financial advisor to Dravus Investment. From August 2015 to January 2016, Global Capital Finance provided strategic advice regarding renewable energy and sustainability to AES Dominicana, a subsidiary of the US power company AES Corp. and largest energy company in the Dominican Republic. In December 2015, Lloyds Banking Group early terminated a US lease transaction for rolling stock entered into in 2003. Global Capital Finance acted as exclusive financial advisor to Lloyds. Global Capital Finance provided valuation and strategic advice to Greentech Energy Systems A/S, an energy company developing, constructing and operating renewable energy projects, in connection with the sale of one of their German wind farms. In June 2015, MVC Capital, a listed investment company in Purchase, NY, sold the 6.8 MW wind farm Schrepkow-Kletzke in Brandenburg, Germany. Global Capital Finance acted as exclusive financial advisor to MVC Capital. In June 2015, MVC Capital, a listed investment company in Purchase, NY, sold the 18 MW wind farm Eixen in Mecklenburg-Western Pomerania, Germany. Global Capital Finance acted as exclusive financial advisor to MVC Capital. In May 2015, Global Capital Finance provided valuation and strategic advice to EOS Holding SA, a Swiss utility corporation, in connection with the contemplated extension of one of their German wind farms. In February 2015, affiliates of Altus Power America Management, LLC entered into partnership flip transactions for 5.6 MW solar PV facilities in Massachusetts. Global Capital Finance acted as exclusive financial advisor to Altus Power America Management. In December 2014, Union Group, a London based investment fund, sold a minority interest in Generacion Andina, a portfolio of hydropower projects under construction in Peru, to Banco Santander. Global Capital Finance acted as financial advisor to Union Group. In December 2014, IWB Industrielle Werke Basel, the utility of the Swiss Kanton Basel, acquired the 16.8 MW wind farm Hamwiede in Lower Saxony, Germany. Global Capital Finance acted as exclusive financial advisor to IWB Industrielle Werke Basel. In December, 2014, BNP Paribas and Deutsche Bank provided EUR 90 million limited recourse acquisition financing to Vortex Energy Investment SARL to partially finance the acquisition of 49% of EDPR’s 334 MW French wind farm portfolio consisting of 33 wind farms located throughout the country. Global Capital Finance arranged the transaction and acted as exclusive financial advisor to Vortex. In December, 2014, Vortex Energy Investment SARL acquired 49% of EDPR’s 334 MW French wind farm portfolio consisting of 33 wind farms located throughout the country. Global Capital Finance arranged the transaction and acted as exclusive financial advisor to Vortex. In October 2014, IWB Industrielle Werke Basel, the utility of the Swiss Kanton Basel, acquired the 12 MW wind farm Les Champs Aux Chats in the Department Pas-de-Calais, France. Global Capital Finance acted as exclusive financial advisor to IWB Industrielle Werke Basel. In July 2014, BayWa r.e. Solar LLC, the wholly owned renewable energy subsidiary of the listed German company BayWa AG, acquired Martifer Solar USA Inc., a U.S. solar PV developer and subsidiary of the listed Portuguese construction company Martifer. Global Capital Finance acted as exclusive financial advisor to BayWa. From June 2010 to June 2014, Global Capital Finance provided valuation services regarding the U.S. power plant portfolio of a fund managed by WealthCap, the fund management arm of Unicredit in Germany. In January 2014, Caisse de dépôt et placement du Québec acquired a 25% interest in the UK offshore wind project London Array with a total capacity of 630 MW. Global Capital Finance acted as originator and strategic advisor to Caisse de dépôt et placement du Québec. In March 2014, Kleinkraftwerk Birseck AG (KKB), a Swiss utility, acquired the 9.2 MW wind farm Selmdorf III, located in Mecklenburg-Vorpommern, Germany. Global Capital Finance acted as exclusive financial advisor to KKB. In March 2014, IWB Industrielle Werke Basel, the utility of the Swiss Kanton Basel, acquired the 6 MW wind farm Les Cinq Hetres in the Department Pas-de-Calais, France. Global Capital Finance acted as exclusive financial advisor to IWB Industrielle Werke Basel. In February 2014, affiliates of Altus Power America Management, LLC entered into partnership flip transactions for 4.8 MW solar PV facilities in Rhode Island and Maryland. Global Capital Finance acted as exclusive financial advisor to Altus Power America Management. In January 2014, Potentia Renewables Inc. acquired 5 rooftop solar PV facilities in Ontario, Canada from German Solar Corporation. Global Capital Finance acted as exclusive financial advisor to Potentia Renewables Inc. In December 2013, AKN Eisenbahn AG (AKN), the joint transportation authority of the State of Hamburg and the State of Schleswig-Holstein, Germany, early terminated a US lease transaction for subway cars entered into in 2001. Global Capital Finance acted as exclusive financial advisor to AKN. In December 2013, Hamburger Hochbahn AG (HHA), Hamburg, Germany, the public transportation company of the State of Hamburg, early terminated a US lease transaction for subway cars entered into in 2001. Global Capital Finance acted as exclusive financial advisor to HHA. In December 2013, CDC Infrastructure, a French entity controlled by Caisse des Dépôts et Consignations (CDC), acquired 33.3% of Marguerite Wind Butendiek SARL, a special purpose vehicle holding 22.5% of the 288 MW Butendiek offshore wind farm, from Marguerite Fund. Global Capital Finance acted as financial advisor to CDC Infrastructure. In November 2013, IWB Industrielle Werke Basel, the utility of the Swiss Kanton Basel, acquired the 12 MW wind Le farm Vert Galant in the Department Pas-de-Calais, France. Global Capital Finance acted as exclusive financial advisor to IWB Industrielle Werke Basel. In November 2013, IWB Industrielle Werke Basel, the utility of the Swiss Kanton Basel, acquired the 12 MW wind farm Le Bois du Haut in the Department Pas-de-Calais, France. Global Capital Finance acted as exclusive financial advisor to IWB Industrielle Werke Basel. In October 2013, Stadtwerke Stuttgart, the utility of the City of Stuttgart, acquired the 16 MW wind farm Everswinkel in the federal state of North-Rhine Westphalia, Germany. Global Capital Finance acted as exclusive financial advisor to Stadtwerke Stuttgart. In August 2013, IWB Industrielle Werke Basel, the utility of the Swiss Kanton Basel, acquired the 12 MW wind farm Le Garimetz in the Department Pas-de-Calais, France. Global Capital Finance acted as exclusive financial advisor to IWB Industrielle Werke Basel. In March 2013, a leading European utility entered into a sale leaseback transaction for a 30 MW solar PV facility. Global Capital Finance arranged the transaction. In January 2013, WV Energie AG, a joint venture of German municipal companies, acquired the 6 MW wind farm Holzhausen, located in Brandenburg, Germany. Global Capital Finance acted as exclusive financial advisor to WV Energie AG. In October 2012, IWB Industrielle Werke Basel, the utility of the Swiss Kanton Basel, acquired the 21 MW wind farm Calau-Schadewitz in the State of Brandenburg, Germany. Global Capital Finance acted as exclusive financial advisor to IWB Industrielle Werke Basel. In June 2012, Hamburger Hochbahn AG (HHA), Hamburg, Germany, the transportation authority of the State of Hamburg, early terminated two QTE lease transactions entered into in 2004 for subway traffic control equipment. Global Capital Finance acted as exclusive financial advisor to HHA. In May 2012, DFS Deutsche Flugsicherung GmbH, the government-owned operator of air traffic control systems in Germany, early terminated two QTE lease transactions entered into in 2003 with Key Bank for air traffic control equipment. Global Capital Finance acted as exclusive financial advisor to DFS Deutsche Flugsicherung GmbH. In May 2012, Sybac Solar LLC, a North American PV solar engineering and construction firm, sold a 1 MW solar PV facility in Gainesville, Florida, to Hanergy Holding America, Inc., the U.S. affiliate of a leading Chinese utility. Global Capital Finance arranged the transaction. In April 2012, DFS Deutsche Flugsicherung GmbH, the government-owned German operator of air traffic control systems in Germany, early terminated three QTE lease transactions entered into between 2002 and 2003 with First Union (now Wells Fargo) for air traffic control equipment. Global Capital Finance acted as exclusive financial advisor to DFS Deutsche Flugsicherung GmbH. In March 2012, Comerica Leasing Corporation, a subsidiary of Comerica, early terminated a US lease transaction entered into in 1997 with Westdeutsche Landesbank Girozentrale (WestLB) for rolling stock of Bochum-Gelsenkirchener Strassenbahnen AG (Bogestra). Global Capital Finance acted as exclusive advisor to Comerica Leasing Corporation. In March 2012, Müllverwertungsanlage Borsigstrasse GmbH Hamburg, Germany, a German corporation controlled by Vattenfall Europe New Energy GmbH (formerly HEW Entsorgung GmbH), early terminated a US lease transaction entered into in 2001 for a waste-to-energy facility. Global Capital Finance acted as exclusive financial advisor to Vattenfall. In March 2012, Müllverwertungsanlage Rugenberger Damm GmbH & Co. KG, Hamburg, Germany, a German company controlled by Vattenfall Europe New Energy GmbH (formerly HEW Entsorgung GmbH), early terminated a US lease transaction entered into in 2001 for a waste-to-energy facility. Global Capital Finance acted as exclusive financial advisor to Vattenfall. In January 2012, IWB Industrielle Werke Basel, the utility of the Swiss Kanton Basel, acquired the 12 MW wind farm Rageade I in the Massif Central, France. Global Capital Finance acted as exclusive financial advisor to IWB Industrielle Werke Basel. In September 2011, Global Capital Finance arranged a CHF 100,000,000 Private Placement for BLS AG (BLS), Switzerland’s 2nd largest railway company. The funds will be used to finance the acquisition of double decker passenger wagons manufactured by Stadler. Global Capital Finance acted as advisor and sole arranger for BLS. In September 2011, Global Capital Finance arranged a CHF 25,000,000 Private Placement for Rhätische Bahn AG (RhB), Switzerland?s largest narrow-gauge railway that services the Canton of Grisons. The funds will be used to finance the acquisition of electric train-sets manufactured by Stadler. Global Capital Finance acted as advisor and sole arranger for RhB. In September 2011, Global Capital Finance arranged a CHF 25,000,000 Private Placement for BLS AG (BLS), Switzerland’s 2nd largest railway company. The funds will be used to finance the acquisition of double decker passenger wagons manufactured by Stadler. Global Capital Finance acted as advisor and sole arranger for BLS. In April 2011, Global Capital Finance arranged a EUR 25,000,000 Private Placement for the refinancing of ewz (Deutschland) GmbH, the German renewable energy subsidiary of ewz, the utility of the City of Zurich. Global Capital Finance acted as advisor and sole arranger for ewz (Deutschland) GmbH and ewz. In April 2011, Global Capital Finance arranged a CHF 10,000,000 Private Loan for Regionalverkehr Bern-Solothurn (RBS), a leading Swiss narrow-gauge commuter railway serving the area of the Swiss capital city of Bern. The long-term funds will be used to finance the acquisition of EMU’s manufactured by Stadler Rail. This transaction is the first ever supported by a State Guarantee issued by the Swiss Confederation and is thus highly attractive for all parties involved. Global Capital Finance acted as advisor and sole arranger for RBS. In December 2010, Dutch Ampere Equity Fund, a project equity fund focused on renewable energy, and Dutch PGGM Infrastructure Fund acquired a 24.8% interest in the UK offshore wind project Walney with a total capacity of 367 MW. Global Capital Finance acted as exclusive financial advisor to Ampere Equity Fund and PGGM Infrastructure Fund. In November 2010, Global Capital Finance provided strategic management and implementation advice to the Department of Finance of the Canton of Bern in connection with its treasury operations. In November 2010, Westdeusche Landesbank Girozentrale (WestLB) early terminated a US lease transaction entered into in 1997 for rolling stock of Bochum-Gelsenkirchener Strassenbahnen AG (Bogestra). Global Capital Finance acted as exclusive financial advisor to WestLB. In June 2010, Global Capital Finance assisted the Spanish national railroad company renfe (Red Nacional de Ferrocarriles Españoles) in the termination of a German Leveraged Lease that renfe had entered into in 1992. In June 2010, BLS AG, Switzerland’s second largest railway operator, closed a Swedish lease transaction. Global Capital Finance acted as exclusive financial advisor to BLS. In June 2010, Global Capital Finance provided ewz (Deutschland) GmbH, a subsidiary of ewz, the utility of the City of Zurich, refinanced EUR 20 mio. through unsecured private placements. Global Capital Finance arranged the transaction. In June 2010, Global Capital Finance performed a risk review of the US lease portfolio for ewz (Elektrizitätswerk der Stadt Zürich), the utility of the City of Zurich, Switzerland. In April 2010, Conetwork Erneuerbare Energien (CEE), a renewable energy focused incorporated multi family office fund affiliate of Bankhaus Lampe, Hamburg, Germany, acquired the 16 MW “Domsdorf” wind farm in Brandenburg, Germany. Global Capital Finance acted as financial advisor to CEE. In May 2010, Hamburger Hochbahn AG (HHA), Hamburg, Germany, the public transportation company of the State of Hamburg, early terminated a US lease transaction closed in 1998. Global Capital Finance acted as exclusive financial advisor to HHA. In May 2010, HelveticWind Deutschland GmbH, a joint venture of the Swiss utilities BKW FMB Energie AG (BKW) and Energie Wasser Bern (ewb), acquired the 14.5 MW Sendenhorst wind farm in North Rhine-Westphalia, Germany. Global Capital Finance acted as financial advisor to BKW. In May 2010, Windet, a Granada, Spain based privately owned wind developer and Establecimientos Industriales y Servicios, (EISSL), a Barcelona based family owned renewable energy investment company sold the wind farm El Conjuro, Spain. Global Capital Finance acted as financial advisor to Windet. In 2009/2010, Global Capital Finance provided Südostbahn AG (SOB), one of Switzerland’s major railroad operators, with strategic advice for their financing concept in connection with the renewal and extension of their rolling stock fleet. In March 2010, Jenaer Nahverkehrsgesellschaft mbH (“JeNah”), the public transportation agency of the City of Jena (Germany), early terminated a US lease transaction it had entered into in 1997. Global Capital Finance acted as exclusive financial advisor to JeNah. In February 2010, Bridge Infrastructure Capital Pty Ltd., a subsidiary of Keybridge Captital Ltd., Sydney, a listed Australian fund management group, has sold a 35 MW wind farm in Midlum, Germany. Global Capital Finance acted as exclusive financial advisor to Bridge Infrastructure Capital Pty Ltd. In December 2009, Global Capital Finance provided SWAY A/S. a Norwegian offshore wind technology company, with a corporate valuation in connection with their contemplated capital raise. In December 2009, the Swiss narrow gauge rail operator Appenzeller Bahnen early terminated a US lease transaction it had entered in 1998. Global Capital Finance acted as exclusive financial advisor to Appenzeller Bahnen. In December 2009, Switzerland’s second largest railway operator BLS early terminated a US lease transaction it had entered in 1998. Global Capital Finance acted as exclusive financial advisor to BLS. In December 2009, Hamburger Hochbahn AG (HHA), Hamburg, Germany, the public transportation company of the State of Hamburg, early terminated a US lease transaction closed in 1995. Global Capital Finance acted as exclusive financial advisor to HHA. In November 2009, Berliner Verkehrsbetriebe (BVG), the public transportation agency of Germany’s Capital State of Berlin, early terminated a US lease transaction it had entered in 1997. Global Capital Finance acted as exclusive financial advisor to BVG. In October 2009, Alpiq Holding AG, the largest Swiss utility and one of Europe’s largest electricity trading companies, acquired a 190 MW wind development portfolio from the Swedish wind developer Kraftö Vind. Global Capital Finance acted as arranger of the transaction. In August 2009, Bridge Infrastructure Capital Pty Ltd. sold a 5.3 MW photovoltaic solar park in the Murcia Province, Spain. Global Capital Finance acted as exclusive advisor to Bridge Infrastructure Capital. In July 2009, BLS AG, Switzerland’s second largest railway company, early terminated a US Lease transaction it had entered in 1997. Global Capital Finance acted as exclusive financial advisor to BLS. In July 2009, Denker & Wulf AG, Sehestadt, Germany, a leading developer of wind farms, sold a 4 MW wind farm. Global Capital Finance acted as exclusive financial advisor to Denker & wulf AG. In July 2009, Global Capital Finance arranged a CHF 50,000,000 Private Placement / Debt Facility for Regionalverkehr Bern-Solothurn (RBS), a leading Swiss narrow-gauge commuter railway serving the area of the Swiss capital city of Bern. The funds will be used to finance the acquisition of six EMU manufactured by Stadler. Global Capital Finance acted as advisor and sole arranger for RBS. In June 2009, Bremer Strassenbahn AG (BSAG), the transportation authority of the German State of Bremen, early terminated a US Lease transaction it hat entered into in 1997. Global Capital Finance acted as exclusive financial advisor to BSAG. In June 2009, BLS AG, Switzerland’s second largest railway company entered into a Swedish Lease financing for new rolling stock. Global Capital Finance acted as exclusive financial advisor to BLS AG. In April 2009, Ampere Equity Fund, a private equity fund focused on renewable energy, acquired Spremberg, a 22.5 MW German wind farm. Global Capital Finance acted as exclusive financial advisor to Ampere Equity Fund. In March 2009, Denker & Wulf AG, Sehestadt, Germany, a leading developer of wind farms, sold Quitzow, a 24 MW wind farm. Global Capital Finance acted as exclusive financial advisor to Denker & Wulf. In November 2008, BKW FMB Energie AG (BKW) acquired the 15 MW wind farm Bockelwitz in Saxony, Germany. Global Capital Finance acted as exclusive financial advisor to BKW. In June 2008, WindVision Ltd., a Belgium wind farm developer, concluded the debt financing of a wind farm in Estinnes, Belgium. Global Capital Finance acted as arranger and financial advisor to WindVision Ltd. for the debt financing of the 54 MW phase I of the wind farm. In March 2008, Lánchíd Holding a Hungarian company sold its shares in Hydro Power Consulting Ltd. to an Australian Investment Fund. Hydro Power Consulting Ltd. focuses on developing and operating hydroelectric generation capacity in Central and Eastern Europe. Global Capital Finance arranged the transaction. In January 2008, Bridge Infrastructure Capital Pty Ltd. acquired a 1.045 MWp solar photovoltaic plant in the Totana region of Spain. Global Capital Finance arranged the transaction. In January 2008, Denker & Wulf AG, Sehestedt, Germany, a leading developer of wind farms, sold a 20 MW wind farm. Global Capital Finance acted as exclusive financial advisor to Denker & Wulf AG. n December 2007, REpower Systems AG, Hamburg, Germany, a leading manufacturer of wind turbines, sold a 25 MW wind farm. Global Capital Finance acted as exclusive financial advisor to REpower Systems AG. In December 2007, New Jersey Transit, the public transportation authority of the State of New Jersey New Jersey, USA, entered into a Swedish lease transaction for the financing of rolling stock. Global Capital Finance acted as exclusive financial advisor to New Jersey Transit. In December 2007, Swiss private rail operator BLS AG terminated part of their US lease transaction entered into in 1998. Global Capital Finance acted as exclusive financial advisor to BLS AG in connection with this termination. In December 2007, Germany’s prime Formula-1 Race Course located in the State of Baden-Württemberg concluded the refinancing of a large part of their outstanding debt at favorable conditions. Global Capital Finance acted as exclusive financial advisor to the Hockenheim-Ring. In November 2007, Global Capital Finance provided Mitsubishi Corporation, Japan’s largest general trading company, with strategic advice in connection with an investment in container ships. In November 2007, the German renewable energy developer NEEC sold a 5.3 MW photovoltaic solar park in the Murcia Province, Spain, to Bridge Infrastructure Capital. Global Capital Finance arranged the transaction. In September 2007, the Swiss narrow gauge rail operator Appenzeller Bahnen terminated part of their US lease transaction entered into in 1998. Global Capital Finance acted as exclusive financial advisor to Appenzeller Bahnen in connection with this termination. During 2007, Global Capital Finance provided BLS AG, the largest Swiss private rail operator, with strategic and practical treasury management advice in connection with the efficient financing of the expansion of their cargo subsidiary BLS Cargo AG. In August 2007, the German renewable energy developer e.n.o. sold a 27.6 MW wind farm. Global Capital Finance arranged the transaction. During 2007, Global Capital Finance provided BLS Cargo AG, one of Europe’s leading private cargo railway companies based in Switzerland, with strategic and practical treasury management advice in connection with the efficient financing of their expanding rolling stock fleet. In summer 2007, Global Capital Finance provided RBS Regionalverkehr-Mittelland AG, a commuter railway active in the area of the Swiss capital city of Bern, with strategic and practical treasury management advice in connection with the efficient financing of the renewal of their rolling stock fleet. In June 2007, Global Capital Finance provided strategic and practical management advice and support to a major Swiss Canton in connection with their launching of a benchmark public Swiss Franc Bond Issue. In May 2007, Bridge Infrastructure Capital Pty Ltd. entered into a joint venture with O’Brien & Gere Ltd., an employee-owned national engineering and project delivery company, based in Syracuse, NY. Operating under the name O’Brien & Gere Utility Services LLC, the new joint venture will provide industrial clients with design-build, operations, financing, and ownership delivery options for water, wastewater and other utility infrastructure assets. Global Capital Finance acted as exclusive financial advisor to Bridge Infrastructure Capital Pty Ltd. In May 2007, BIC Shipping Ltd., British Virgin Islands, acquired the 103,203 dwt BIC Irini OBO vessel. Global Capital Finance acted as exclusive financial advisor to BIC Shipping Ltd. In May 2007, BIC Shipping Ltd., British Virgin Islands, acquired the 103,203 dwt BIC Clare OBO vessel. Global Capital Finance acted as exclusive financial advisor to BIC Shipping Ltd. In April 2007, Bridge Infrastructure Capital Pty Ltd., a subsidiary of Mariner Bridge Investments Ltd., Sydney, a listed Australian fund management group, has acquired a 35 MW wind farm in Midlum, Germany. Global Capital Finance acted as exclusive advisor to Bridge Infrastructure Capital Pty Ltd. In April 2007, a Russian owned real estate company headquartered in Switzerland refinanced their Corporate Jet at favorable conditions. Global Capital Finance acted as exclusive financial advisor to the company in connection with this refinancing. In February 2007, Bernuth Lines, Miami, Florida, an international shipping company, obtained a debt facility to refinance existing debt regarding container vessels as well as a revolving credit line. Global Capital Finance acted as financial advisor to Bernuth Lines. In December 2006,Siba Ships S.p.A., Brescia, Italy, an Italian shipping company, entered into a sale and a bareboat charter back of dry bulk vessels. Global Capital Finance acted as financial advisor to Siba Ships. In December 2006, Denker & Wulf AG, Sehestadt, Germany, a leading developer of wind farms, sold an 18 MW wind farm. Global Capital Finance acted as exclusive financial advisor to Denker & Wulf AG. In July 2006, Denker & Wulf AG, Sehestadt, Germany, a leading developer of wind farms, sold a 6.8 MW wind farm. Global Capital Finance acted as exclusive financial advisor to Denker & Wulf AG. In July 2006, TBS International Ltd., Hamilton, Bermuda, an international liner and bulk shipping company, obtained a debt facility to refinance existing debt regarding dry cargo vessels as well as a revolving credit line. Global Capital Finance acted as exclusive financial advisor to TBS International Ltd. In July 2006, Regionalverkehr Mittelland AG, Burgdorf, Switzerland, was merged into BLS AG. In order to consummate this transaction, certain financing transactions had to be restructured. Global Capital Finance acted as financial advisor to Regionalverkehr Mittelland AG. In July 2006, BLS Lötschbergbahn AG, Bern, Switzerland, was merged into BLS AG. In order to consummate this transaction, certain financing transactions had to be restructured. Global Capital Finance acted as financial advisor to BLS Lötschbergbahn AG. In May 2006, International Hotel Investments BV, a subsidiary of IHI Hotel Investments plc, Floriana, Malta, an affiliate of the Corinthia Group, a leading hotel investment, development, and management company, closed a structured debt facility regarding the Nevskij Palace Hotel in St. Petersburg, Russia. Global Capital Finance acted as financial advisor to IHI Investments plc. In March 2006, Hockenheim-Ring GmbH, Hockenheim, Germany, the company that owns and manages the Hockenheim race course, restructured existing debt. Global Capital Finance acted as exclusive financial advisor to Winterthur Life. In November 2005, New Jersey Transit, Newark, New Jersey, USA, the public transportation authority of the State of New Jersey, entered into a French lease transaction for rolling stock. Global Capital Finance acted as exclusive financial advisor to New Jersey Transit. In October 2005, Corinthia Palace Hotel Company Ltd., Valletta, Malta, an affiliate of the Corinthia Group, a leading hotel investment, development, and management company, closed a structured debt facility regarding its properties in Prague. Global Capital Finance acted as financial advisor to Corinthia Palace Hotel Company Ltd. In September 2005, Denker & Wulf AG, Seelstedt, Germany, a leading developer of wind farms, sold a 9 MW wind farm. Global Capital Finance acted as exclusive financial advisor to Denker & Wulf AG. In September 2005, Denker & Wulf AG, Seelstedt, Germany, a leading developer of wind farms, sold a 12 MW wind farm. Global Capital Finance acted as exclusive financial advisor to Denker & Wulf AG. In September 2005, Denker & Wulf AG, Seelstedt, Germany, a leading developer of wind farms, sold a 27 MW wind farm. Global Capital Finance acted as exclusive financial advisor to Denker & Wulf AG. In September 2005, REpower Systems AG, Hamburg, Germany, a leading manufacturer of wind turbines, sold a 24 MW wind farm. Global Capital Finance acted as exclusive financial advisor to REpower Systems AG. In September 2005, Hamburger Hochbahn AG, Hamburg, Germany, the public transportation company of the State of Hamburg, entered into a cross-border lease for rolling stock. Global Capital Finance acted as exclusive financial advisor to Hamburger Hochbahn AG. In August 2005, ABB Schweiz AG (ABB), Baden, Switzerland early terminated a Swiss lease transaction of rolling stock. Global Capital Finance acted as exclusive financial advisor to ABB. In July 2005, ABB Schweiz AG (ABB), Baden, Switzerland, early terminated a German/Swiss lease transaction of a gas turbine generator. Global Capital Finance acted as exclusive financial advisor to ABB. In June 2005, TBS International Ltd., Hamilton, Bermuda, an international liner and bulk shipping company, obtained a debt facility to finance the acquisition of dry cargo vessels. Global Capital Finance acted as exclusive financial advisor to TBS International Ltd. In May through July 2005, the Swiss National Bank distributed some CHF 14 billion of unused currency reserves amongst the Swiss Cantons as previously agreed with the Swiss Government. Global Capital Finance provided strategic and practical treasury management advice to one of the Cantons in connection with the use of these funds, in particular its debt reduction policy and implementation thereof. In January 2005, a lessor has early terminated a US lease transaction of a power plant. Global Capital Finance acted as financial advisor to the lessor. In December 2004, Rhätische Bahn, Chur, Switzerland restructured a US lease transaction of rolling stock. Global Capital Finance acted as exclusive financial advisor to Rhätische Bahn. In December 2004, BLS Lötschbergbahn AG, Bern, Switzerland restructured a US lease transaction of rolling stock. Global Capital Finance acted as exclusive financial advisor to BLS Lötschbergbahn AG. In December 2004, Hamburger Hochbahn AG, Hamburg, Germany, the public transportation company of the State of Hamburg, restructured a US lease transaction. Global Capital Finance acted as exclusive financial advisor to Hamburger Hochbahn AG. In December 2004, BLS Lötschbergbahn AG, Bern, Switzerland subleased rolling stock subject to a US lease transaction to another railway company. Global Capital Finance acted as exclusive financial advisor to BLS Lötschbergbahn AG. In December 2004, Rhätische Bahn, Chur, Switzerland early terminated a US lease transaction of rolling stock. Global Capital Finance acted as exclusive financial advisor to Rhätische Bahn. In September 2004, a lessor has early terminated a US lease transaction of rolling stock. Global Capital Finance acted as financial advisor to the lessor. In September 2004, Vertis, Inc., Baltimore, Maryland, USA, early terminated two US lease transactions of real estate. Global Capital Finance acted as exclusive financial advisor to Vertis, Inc. In July 2004, New Jersey Transit, Newark, New Jersey, USA, the public transportation authority of the State of New Jersey, entered into a French lease transaction for articulated transit and suburban buses. Global Capital Finance acted as exclusive financial advisor to New Jersey Transit. In February 2004, Hamburger Hochbahn AG, Hamburg, Germany, the public transportation company of the State of Hamburg, entered into a US lease for train security and ticketing equipment. Global Capital Finance acted as exclusive financial advisor to Hamburger Hochbahn AG. In November 2003, Halifax Bank of Scotland, London, England, a leading financial institution in the UK, entered into a US lease transaction for train sets operated by Virgin Rail on the Cross Country Line. Global Capital Finance acted as exclusive financial advisor to Halifax Bank of Scotland. In September and October 2003, New Jersey Transit, Newark, New Jersey, USA, the public transportation authority of the State of New Jersey, entered into a French lease transaction for light rail vehicles. Global Capital Finance acted as exclusive financial advisor to New Jersey Transit. In September 2003, San Francisco Municipal Railway (“Muni”), San Francisco, California, USA, an agency of the City and County of San Francisco, entered into a US lease transaction for light rail vehicles. Global Capital Finance acted as financial advisor to Muni. In September 2003, Halifax Bank of Scotland, London, England, a leading financial institution in the UK, entered into a US lease transaction for train sets operated by Virgin Rail on the Cross Country Line. Global Capital Finance acted as exclusive financial advisor to Halifax Bank of Scotland. In August 2003, Braunschweiger Verkehrs-AG, Braunschweig, Germany, the public transportation authority of the City of Braunschweig, entered into a US lease transaction for trams. Global Capital Finance acted as exclusive financial advisor to Braunschweiger Verkehrs-AG. In August 2003, Leipziger Verkehrsbetriebe GmbH, Leipzig, Germany, the public transportation authority of the City of Leipzig, entered into a US lease transaction for trailer cars. Global Capital Finance acted as financial advisor to Leipziger Verkehrsbetriebe GmbH. In March 2003, Winterthur Life, Winterthur, Switzerland, restructured a US lease transaction. Global Capital Finance acted as exclusive financial advisor to Winterthur Life. In March 2003, Kommunale Wasserwerke Leipzig GmbH, Leipzig, Germany, a utility of the City of Leipzig managing the drinking water activities of the city, entered into a US lease transaction for its fresh water supply system. Global Capital Finance acted as financial advisor to Kommunale Wasserwerke Leipzig GmbH. In December 2002, Berliner Verkehrsbetriebe, Berlin, Germany, the public transportation authority of the State of Berlin, entered into a US lease transaction for trams. Global Capital Finance acted as exclusive financial advisor to Berliner Verkehrsbetriebe. In December 2002, Leipziger Verkehrsbetriebe GmbH, Leipzig, Germany, the public transportation authority of the City of Leipzig, entered into a US lease transaction for its tram network. Global Capital Finance acted as financial advisor to Leipziger Verkehrsbetriebe GmbH. In December 2002, Natural Gas Corporation, Wellington, New Zealand, one of New Zealand’s leading utilities, early terminated a German lease transaction of power generating assets. Global Capital Finance acted as exclusive financial advisor to Natural Gas Corporation. In December 2002, Brussels International Airport Company, Brussels, Belgium, entered into a US lease transaction for its baggage handling equipment and airport security equipment. Global Capital Finance acted as financial advisor to Brussels International Airport Company. In December 2002, Essener Verkehrs-AG, Essen, Germany, the public transportation company of the City of Essen entered into a US lease transaction for rail QTE. Global Capital Finance acted as special financial advisor to Essener Verkehrs-AG. In October 2002, Berliner Verkehrsbetriebe, Berlin, Germany, the public transportation authority of the State of Berlin, entered into a US lease transaction for subway cars. Global Capital Finance acted as exclusive financial advisor to Berliner Verkehrsbetriebe. In September 2002, Uniworld Global, Inc, Los Angeles, California, USA, a private company that owns and operates a fleet of river cruise ships in the USA and Europe, financed a river cruise ship operated in Europe through a German lease transaction. Global Capital Finance acted as exclusive financial advisor to Uniworld Global, Inc. In September 2002, Berliner Verkehrsbetriebe, Berlin, Germany, the public transportation authority of the State of Berlin, entered into a US lease transaction for trams. Global Capital Finance acted as exclusive financial advisor to Berliner Verkehrsbetriebe. In September 2002, Berliner Verkehrsbetriebe, Berlin, Germany, the public transportation authority of the State of Berlin, entered into a US lease transaction for subway cars. Global Capital Finance acted as exclusive financial advisor to Berliner Verkehrsbetriebe. In July 2002, Essener Verkehrs-AG, Essen, Germany, the public transportation company of the City of Essen entered into a US lease transaction for rolling stock. Global Capital Finance acted as exclusive financial advisor to Essener Verkehrs-AG. In July 2002, Jenaer Nahverkehrsgesellschaft mbH, Jena, Germany, the public transportation authority of the City of Jena entered into a US lease transaction for rolling stock. Global Capital Finance acted as exclusive financial advisor to Jenaer Nahverkehrsgesellschaft mbH. In July 2002, Hallesche Verkehrs-AG, Halle, Germany, the public transportation authority of the City of Halle entered into a US lease transaction for rolling stock. Global Capital Finance acted as financial advisor to Hallesche Verkehrs-AG. In July 2002, Magdeburger Verkehrsbetriebe GmbH, Magdeburg, Germany, the public transportation authority of the City of Magdeburg entered into a US lease transaction for rolling stock. Global Capital Finance acted as financial advisor to Magdeburger Verkehrsbetriebe GmbH. In June 2002, Stadtentwässerung Kaiserslautern, Germany, a division of the City of Kaiserslautern managing the wastewater activities of the city, entered into a US lease transaction for a wastewater treatment plant and a wastewater collection system. Global Capital Finance acted as financial advisor to Stadtentwässerung Kaiserslautern. In June 2002, Schweriner Abwasserentsorgung, Schwerin, Germany, a division of the City of Schwerin managing the wastewater activities of the city, entered into a US lease transaction for a wastewater treatment plant and a wastewater collection system. Global Capital Finance acted as financial advisor to Schweriner Abwasserentsorgung. In June 2002, Stadtwerke Schwerin GmbH, Schwerin, Germany, a utility of the City of Schwerin managing the drinking water activities of the city, entered into a US lease transaction for its fresh water supply system. Global Capital Finance acted as financial advisor to Stadtwerke Schwerin GmbH. In May 2002, Essener Verkehrs-AG, Essen, Germany, the public transportation company of the City of Essen entered into a US lease transaction for rolling stock. Global Capital Finance acted as exclusive financial advisor to Essener Verkehrs-AG. In April 2002, San Francisco Municipal Railway (Muni), San Francisco, California, USA, an agency of the City and County of San Francisco, entered into a US lease transaction for rolling stock. Global Capital Finance acted as financial advisor to Muni. In December 2001, ABB Financial Services, Mannheim, Germany, early terminated seven German lease transactions with clients in the Netherlands and the US. Global Capital Finance acted as exclusive financial advisor to ABB Financial Services. In September 2001, Müllverwertung Borsigstrasse GmbH, Hamburg, Germany, a German corporation controlled by HEW Entsorgung GmbH, entered into a US lease transaction for a 320,000 t/a waste-to-energy facility. Global Capital Finance acted as exclusive financial advisor to HEW Entsorgung GmbH. In September 2001, Müllverwertungsanlage Rugenberger Damm GmbH & Co. KG, Hamburg, Germany, a German company controlled by HEW Entsorgung GmbH, entered into a US lease transaction for a 320,000 t/a waste-to-energy facility. Global Capital Finance acted as exclusive financial advisor to HEW Entsorgung GmbH. In May 2001, AKN Eisenbahn AG, Kaltenkirchen, Germany, a public transportation company owned by the States of Hamburg and Schleswig-Holstein, entered into a US lease for rolling stock. Global Capital Finance acted as financial advisor to AKN Eisenbahn AG. In May 2001, Hamburger Hochbahn AG, Hamburg, Germany, the public transportation company of the State of Hamburg, entered into a US lease for rolling stock. Global Capital Finance acted as exclusive financial advisor to Hamburger Hochbahn AG. In May 2001, the shareholders of Messe Zürich, Zürich, Switzerland and Messe Basel, Basel, Switzerland had approved the formation of a joint holding company to merge activities. In order to consummate this transaction, certain financing transactions had to be restructured. Global Capital Finance acted as financial advisor to Messe Zürich. In March 2001, the New Jersey Sports and Exposition Authority (NJSEA), Jersey City, New Jersey, USA, an authority of the State of New Jersey entered into a US lease transaction for a 500,000 square feet convention center in Atlantic City. Global Capital Finance acted as financial advisor to NJSEA. In 2001, the Long Island Power Authority (LIPA), Uniondale, New York, USA had evaluated the exercise of certain options to buy 4,000 MW of generating assets from Keyspan. Global Capital Finance acted as financial advisor to LIPA.